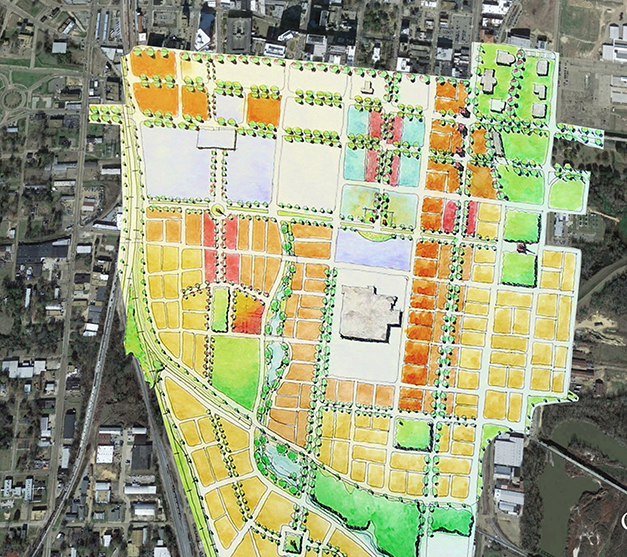 The City of Jackson, Mississippi had multiple development projects poised for kick off, but lacked a strategic plan to leverage the economic potential of pending reinvestment. The Jackson Downtown Strategic Plan examined the larger context of the city to determine strengths, challenges, opportunities and determine community wants and needs. Through examination of existing conditions, stakeholder interviews, a public workshop, charrette, and market study, a strategic plan emerged. Jackson is the state capital and the seat for many important institutions. The original framework of streets remained in place, however many were now configured as one-way pairs. Recommendations included eliminating one-way streets where possible, and celebrating Capital Avenue as a premier boulevard. There was also a lack of residential neighborhoods, and after business hours, downtown streets were deserted. Adjacent to downtown, a new residential and mixed-use scenario depicted how the city grid could extend into this area and spur economic development. To date, economic investment has been guided by the plan, and it is periodically updated by city officials. 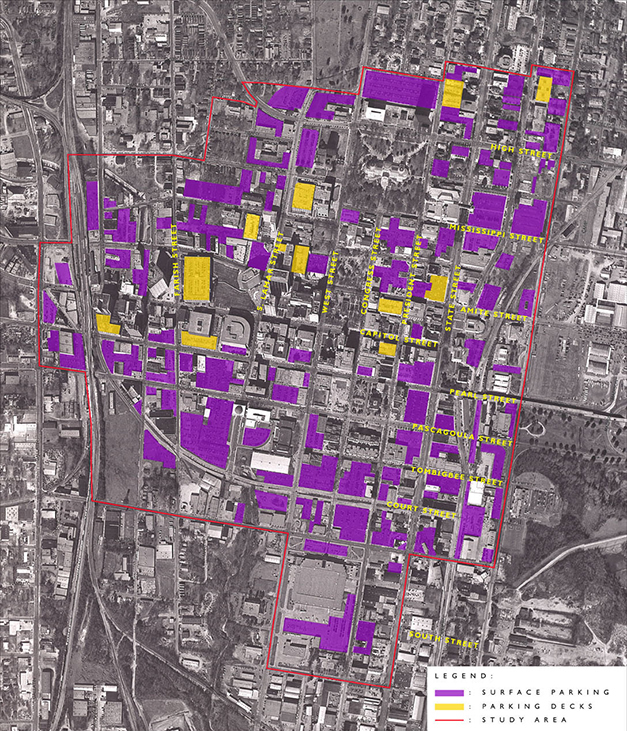 Note: this work performed at Cooper Carry, Inc.
To understand the challenges facing downtown Jackson, vacant and underutilized properties were mapped. The downtown core was fragmented by the sheer number of surface parking lots. 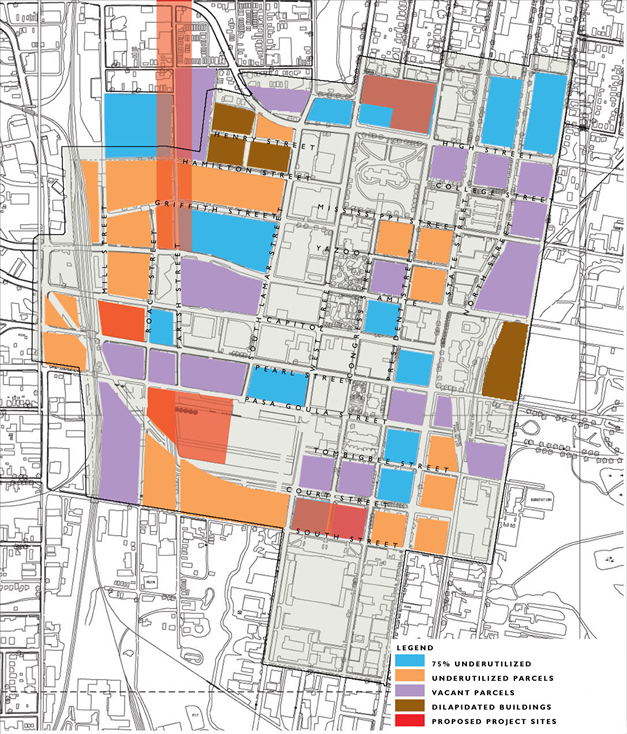 The southwest sector of downtown is planned for residential and mixed use redevelopment. 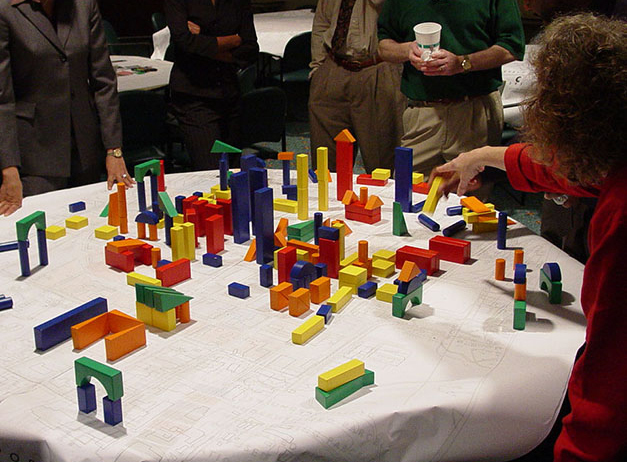 A public workshop encouraged residents to "build" their vision in three dimensions.